The clip above, which I’m sure you watched as soon as you arrived at this page, is a quick iPhone recording to show you little Chupa-Chupa only two hours after the team started training it. It does not live up to the quality of the movies I usually show but bear with me. I just had to capture the moment and show it to you. I must compliment Michael and Natalie for the brilliant job they have done imprinting and socializing the young Guinea pigs. Without it, we would have spent the whole day yesterday, and would spend most of today, habituating them to the environment, novel stimuli, humans, etc. As they are, the teams could teach them all the agility obstacles. This is the first time we have achieved it in one day, undoubtedly due to the perfect imprinting and socialization of the piggies. Though this makes it much easier for the camp attendees to train the Guinea pigs, it also deprives them of the experience of going thru the laborious process of imprinting and socialization. Fortunately, we have a couple of older piggies, Michael and Natalie got later, for comparison. I wished dog breeders knew more about these all relevant mechanisms in the formation of behavior. Imagine that all puppies were perfectly imprinted and socialized to the human world. I bet we would see a dramatic fall in problem behavior and wouldn’t that be splendid? Imprinting describes any kind of phase-sensitive learning (learning occurring at a particular life stage) that is rapid and apparently independent of the consequences of behavior. Imprinting affects subsequent social adjustment and sexual behavior among others. It occurs immediately after birth or early in life. Though critical for the future behavior of the animal, its preferences and aversions, the consequences of imprinting are not as rapid or as irreversible as Lorenz and the early ethologists thought. Studies of wolf cubs show that although the period of imprinting is longer than in ducks, and most birds, it is just as important. Holding a wolf cub in our hands for three minutes a day in the first 10 days makes all the difference in its behavior towards humans later in life. The same applies to our domestic dogs, even if they are more flexible. The difference is that we have selected dogs for thousands of years for their sociability. They have probably many genes determining this trait, allowing imprinting for longer, or over several periods. A sensitive period (or critical period) is a limited time in which an event can occur, usually resulting in some transformation. If the organism does not receive the appropriate stimulus during this time, it may be difficult, or even impossible, to develop some functions later in life. Evidence suggests that there may be more than one type of a sensitive period. Recent studies point out that the critical phase for sexual imprinting occurs later than that for filial imprinting. Researchers discovered that learning components are more important than previously thought. There is evidence that cumulative learning entails the release of endorphins in the brain providing a comforting feedback and, thus, fixing the association. As amazed as the camp attendees are with the speedy progress of their training (at the end of the first day, they have gone thru all agility obstacles, including weave poles), what left them flabbergasted today was the limited use of food treats and that we did not use training tools and gadgets at all. This is training the ethology way, my preferred method of interacting with animals. We create a relationship of mutual trust and respect, with higher benefits than costs, leading by example, meeting the animal half-way, controlling ourselves rather than the animal. Watch this space, my friends, I will tell you more tomorrow. 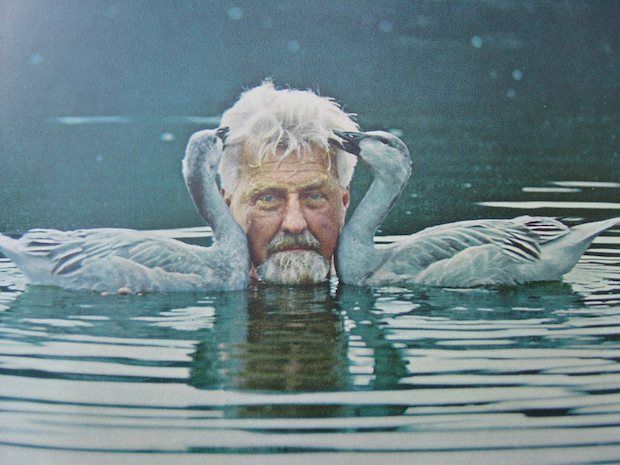 Featured image: Konrad Lorenz and his geese showing the effect of imprinting. Bonding in dogs is indeed an interesting topic. You’ll see in a short while what I mean. Guinea pig camp starting tomorrow, Michael and Natalie of Ready, Sit, Go are busy with the last preparations, but there’s always time for a nice dinner and a couple of hours around the pool table. Fantasia on San Fernando in Burbank is my favorite pool hall and sports bar in the area. It has a relaxed atmosphere, a diversity of clients, good Brunswick 9-foot tables and Guinness on draught. Pool is a great game. It requires technique, strategy, mind, skill, and it is a social activity. You play, talk, crack a joke or pick up a serious topic, and you have a good time with your mates (= buddies in the US). “Bonding,” he answered, “bonding in dogs”—and so bonding it is. Parents and offspring develop strong bonds so that the former take care of the latter and the latter accept the teachings of the former. This serves both parties best. As a result of filial bonding, offspring and parents or foster parents develop an attachment. This attachment ceases to be important once the juvenile reaches adulthood, but may have long-term effects upon subsequent social behavior. Among domestic dogs, for example, there is a sensitive period from the third to the tenth week of age, during which normal contacts develop. If a puppy grows up in isolation beyond about fourteen weeks of age, it will not develop normal relationships. Males and females of social species develop strong bonds during courtship motivating them to care for their progeny, so they increase their chances of the survival of 50% of their genes. Social animals develop bonds by living together and having to fend for their survival day after day. Grooming, playing, mutual feeding, all have a relevant role in bonding. Intense experiences do too. Between adults, surviving moments of danger together seems to be strongly bonding. Bonding behavior like grooming and feeding seems to release neurotransmitters (e.g., oxytocin), which lowers the innate defensiveness, thereby increasing the chances of bonding. We often mention bonding together with imprinting. Even though imprinting is bonding, not all bonding is imprinting. Imprinting describes any type of phase-sensitive learning (learning occurring at a particular age or a specific life stage) that is rapid and (apparently) independent of the consequences of behavior. Some animals appear to be preprogrammed to learn about certain aspects of the environment during particular sensitive phases of their development. The learning is pre-programmed in the sense that it will occur without any visible reinforcement or punishment. Our dogs in our domestic environments develop bonds in various ways. Grooming, resting with each other, barking together, playing and chasing intruders are strong bonding behaviors. Their bonding behavior is by no means restricted to individuals of their species. They bond with the family cat as well and with us, humans. Bonding is a natural process that will inevitably happen when individuals share responsibilities. Looking into one another’s eyes is only bonding for a while, but surviving together may be bonding for life—and this applies to all social animals, dogs and humans included. 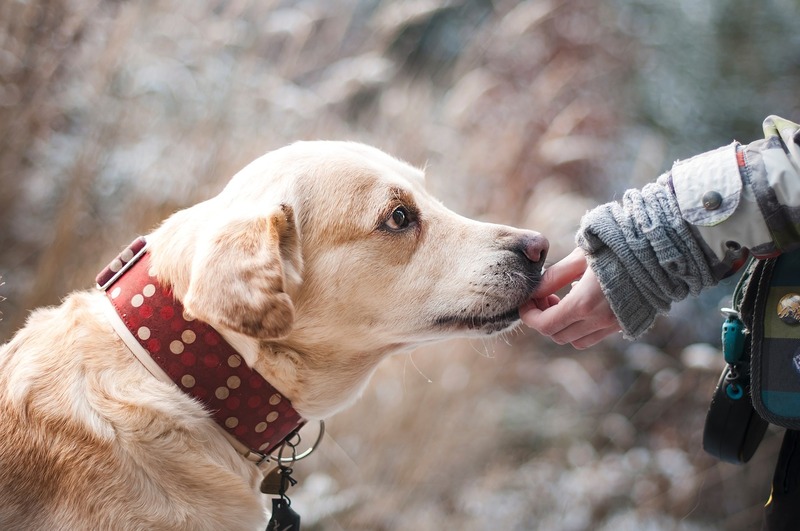 We develop stronger bonds with our dogs by doing things together rather than by just sitting and petting them. These days, we are so afraid of anything remotely connected with stress that we forget the strongest bonds ever originate under times of intense experiences. A little stress doesn’t harm anyone, quite the contrary. I see it every time I train canine scent detection. The easier it is, the quickest it will be forgotten. A tough nut to crack, on the other hand, is an everlasting memory binding the parties to one another. I even suspect one of the reasons we have so many divorces these days is that we want everything to be easy, and oh so pleasant, that in the end, nothing is holding the two together—but that’s another story for maybe another time. Guinea pig camp tomorrow—it’s time to bond with these loving little creatures. Featured image: Bonding with your dog. (photo by pixabay, https://pixabay.com/en/dog-friendship-nature-trust-1861839/). Learn more in our course Canine Scent Detection, which will enable you to pursue further goals, such as becoming a substance detection team or a SAR unit. You complete the course by passing the double-blind test locating a hidden scent. You take the theory online in the first three lessons. In lesson four, you train yourself and your dog, step by step until reaching your goal. We will assign you a qualified tutor to guide you, one-on-one, either on-site or by video conferencing.